1/3 inches Super HAD CCD. 540 TV Lines. HQ-1. SHD4-7540DN. 420 TV Lines. SSD4-7420. 3.6mm Standard Lens. 0.5 Lux @ F2.0SHD4-7540DN. 0.3 Lux @ F2.0SSD4-7420. Auto Backlight Compensation. 12V DC. 1/3 inches Super HAD CCD. 420 TV Lines. 2.9mm~10.0mm Aspherical Auto Iris Lens / F1.2. Lens Made in Japan. High Gain / Low Noise Amplifier - DNR. 0.15 Lux @ F1.2. 3-AXIS design for any angle. Power:12V DC. 1/3 inches Sharp CCD. 540 TV Lines. 3.6mm Board Lens. 0.2 Lux @ F2.0. 3-AXIS Design for any angle. 12V DC. 75mA. 1/3 inches Super HAD CCD. 420 TV Lines. 3.6mm Lens. 12V DC. 3-Axis Bracket / White. 1 Year Warranty. 1/3 inches Super HAD CCD II. Color: 610 TVL. B/W: 630 TVL. 3.6mm Standard Lens. 12V DC / Balck. 1 Year Warranty. 1/3 inches Super HAD CCD II. Color: 610 TVL. B/W: 630 TVL. 3.6mm Standard Lens. 12V DC / White. 1 Year Warranty. 1/3 inches Super HAD CCD II. Color: 610 TVL. B/W: 630 TVL. 2.8 mm~10.5mm Auto Iris Lens. 12V DC 3-AXIS Bracket /Black. 1 Year Warranty. 1/3 inches 760H Super HAD CCD II. Color: 610 TVL. B/W: 630 TVL. 2.8 mm~ 10.5mm / F1.2 Aspherical Auto Iris Lens. 12V DC / 24V AC. 3-AXIS Bracket / Black. 1 Year Warranty. 1/3 inches 960H Exview CCD. Effio-E DSP. Color: 680 TVL. B/W: 700 TVL. Color: 0.1 Lux @ F1.2. B/W: 0.08 Lux @ F1.2. Multi-Language OSD Control. ATR Digital Powerful 128x WDR (52dB). Anti-Headlight (HLC). 2D Noise Reduction. High Contrast Images. Ideal for Backlight Environments. Mosaic Privacy Mask. Advanced Motion Detection Function. Picture Quality Adjustable (Contrast/Sharpness/Hue/Gain). Water Resistance: IP66; Breaking Strength: 656.1Kgf. Built-in Varifocal Lens & Unique 3-axis Gimble Mechanism. 1/3 inches 760H Super HAD CCD II. Effio-E DSP. Color: 610 TVL. B/W: 630 TVL. Color: 0.15 Lux @ F1.2. B/W: 0.1 Lux @ F1.2. Multi-Language OSD Control. ATR Digital Powerful 128x WDR (52dB). Anti-Headlight (HLC). 2D Noise Reduction. High Contrast Images. Ideal for Backlight Environments. Mosaic Privacy Mask. Advanced Motion Detection Function. Picture Quality Adjustable (Contrast/Sharpness/Hue/Gain). Built-in Varifocal Lens & Unique 3 Axis Gimble Mechanism. 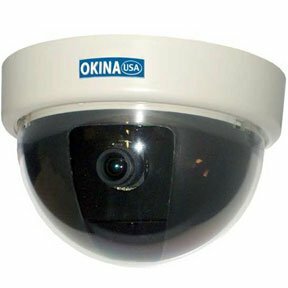 Indoor dome cameras are popular in the segment of security cameras these days. You can also order indoor dome cameras at SF Cable. We have Sony Super HAD Dome 420TL, Super HAD Dome D/N 420TVL 3-Axis, ceiling embedded mounts, dome cameras with dual power, hyper wide dynamic indoor dome cameras, and a huge variety of dome cameras varying in design, price, and brands. All our products are RoHS compliant that speaks for the safety of the products and we source the products directly from manufacturers that answer for the competitive prices we offer. We provide good after sale services and lifetime technical support on all our products.